(Ottawa, Ont.) 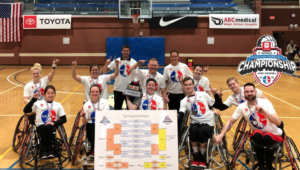 Canadian wheelchair basketball players joined in on the madness this March with stellar performances south of the border at the National Wheelchair Basketball Association (NWBA) divisional and college finals as part of the NWBA Toyota National Championship Series. The Toronto Rollin’ Raptors were crowned national champions in division II at the league finals in Tallmadge, Ohio earlier this month. The sixth seeded Raptors upset the top seeded L.A. Hotwheels 54-46 in the championship game. Kady Dandeneau earned tournament MVP honours in addition to being the player of the game in the championship final. Teammates Élodie Tessier and Erica Gavel were both named first team all-stars. In addition to Dandeneau, Gavel and Tessier, athletes Josh Brown, Dalton Campbell, Danielle Duplessis, Melanie Hawtin, Derek Jezewsky, Puisand Lai, Tamara Steeves and Darek Symonowicz represented the Raptors this season. The team was coached by Senior Women’s National Team head coach Marc Antoine Ducharme. The New York Rollin’ Knicks continued their dominance by picking up their second consecutive national title at the Toyota Division I National Championship this past weekend in Tallmadge, Ohio. The Knicks defeated the Milwaukee Wheelchair Bucks 69-52 in the final. The Knicks feature the Canadian trio of Patrick Anderson, David Eng and Tyler Miller. Anderson picked up 46 points in the championship game, earning player of the game and tournament MVP honours. Eng was named a second team all-star. The Toronto Rollin’ Raptors division I team placed 11th at nationals and ended the tournament with a 2-2 record. Athletes Dani Bigu, Deion Green, Bo Hedges, Jesse Heubner, Westley Johnston, Michael Kilonzo, Lee Melymick, Blaise Mutware and Eric Voss all represented the Raptors division I team in 2018-19. The team was coached by Senior Men’s National Team head coach Matteo Feriani. 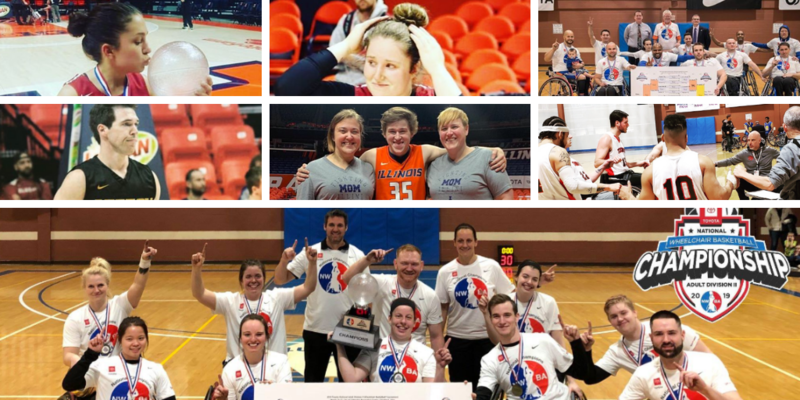 In college play, Canadians Rosalie Lalonde and Arinn Young were victorious with the University of Alabama at the 2019 Toyota National Intercollegiate Wheelchair Basketball Tournament in Champaign, Illinois. Alabama defeated the University of Texas-Arlington 82-76 in overtime to claim its third national title in the last five years. Young was an offensive force in the heated final, recording a triple-double courtesy of 39 points, 11 rebounds and 10 assists, while Lalonde provided solid secondary scoring with 12 points of her own. Young was named the player of the game and the MVP. Fellow Canadians Colin Higgins and Ben Moronchuk also competed at the college finals in Champaign, Illinois. Higgins wrapped up his freshman season with the University of Missouri with a fourth place finish at nationals, while Moronchuk completed his first season with the University of Illinois as the Fighting Illini finished in sixth place on home court. The trio of Young, Lalonde and Higgins also picked up some hardware with NWBA intercollegiate awards for the 2018-19 season. Young was named a first team All-American and Lalonde earned a nod on the All-American second team after strong seasons for the Crimson Tide. Higgins was named to the All-Rookie team in his freshman season with Mizzou. With the NWBA season in the books and the calendar set to shift to April, focus now turns to the upcoming Canadian league finals. The Canadian Wheelchair Basketball League (CWBL) Women’s National Championship gets underway in Montreal from April 12-14, 2019, then it’s off to the Maritimes from April 26-28, 2019 for the CWBL National Championship in Charlottetown, P.E.I. Be sure to follow all of the action on our social channels and wheelchairbasketball.ca.